StandOut can be customized based on specific positions in your organization. StandOut is a leadership effectiveness platform based on decades of performance research with the world’s best leaders. Beginning with an assessment, it pinpoints your strengths as a leader and then gives you all the tools you need to lead your teams with greater intelligence, precision and impact. You need the StandOut platform if…you want a personalized leadership coach in your pocket. Accelerate your performance and accentuate your leadership style by discovering what makes you uniquely effective. This dynamic learning experience gives trainers everything they need to deliver a 1:1 individual StandOut debrief, 90 minute introduction, 4 hour abridged workshop, and 8 hour interactive workshop based on the StandOut assessment. 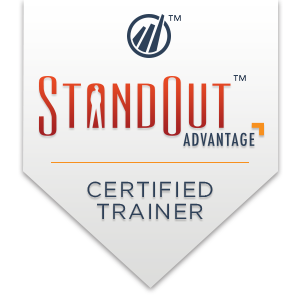 The StandOut Advantage Certified Trainer program provides a complete outline of the assessment, detailed practical exercises, and compelling activities that lead groups to engage their StandOut strengths and take action. Dr Tavantzis became a Certified Trainer in Spring, 2013 and since then he has delivered both team and individual programs in a variety of organizations.